We had a couple quarts of rich grape juice leftover after making jelly, pretty much all the stuff from my second squeezings. 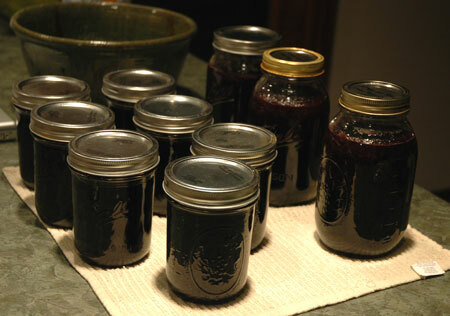 I wasn’t about to let it go to waste, so I decided to make some grape syrup, carefully measuring out enough juice to make one canner-load of pint jars and bringing it to a simmer with lots of sugar, a little honey, and a splash of lemon juice. 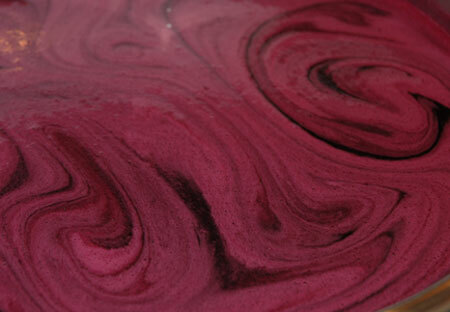 It foamed like crazy—I think I skimmed off several cups’ worth of foam before it came to a rolling boil. And then somehow we still managed to have enough syrup in the pot to can 10 pints, a head-scratcher after my calculations from the recipe. 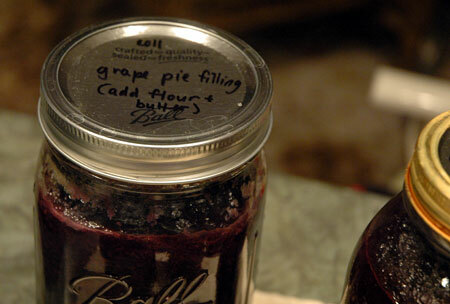 We also canned 3 quart jars full of grape pie filling to use later on in the year. This was really an experiment because in the past, we have only ever frozen extra filling, but are sorely lacking on freezer space this season. I basically made a triple batch of pie filling, peeling the grapes and straining the seedy pulp, pureeing the skins with sugar and lemon juice. For canning, I left out the recipe’s flour and butter, and brought the whole mixture up to a bare simmer before ladling into sterile jars. We won’t know for sure how this worked out until we pop a jar open and try making pie, but it seems very promising. We also made a couple fresh pies with the remaining grapes. One went to the community garden harvest potluck before it had totally cooled, so it was pretty liquidy, but that didn’t stop our gardening friends from gobbling up the whole thing with vanilla ice cream. 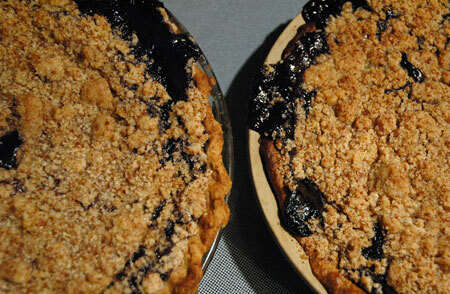 Both of these pies used my sourdough crust and incorporated some coconut sugar into the streusel topping. Finally, I also came back to the red wine vinegar experiment I started in the first week of the grape harvest, mixing the spent mash from jam-making with water and whey. 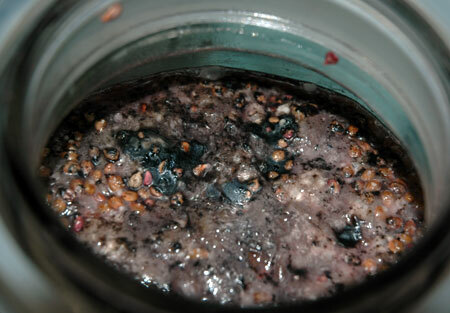 After almost two weeks of fermenting, this is what it looked like on top: a mixture of seeds and grape skin flotsam in the gelatinous matrix of a mother culture. Not the most appetizing sight, but a very good sign for vinegar creation! 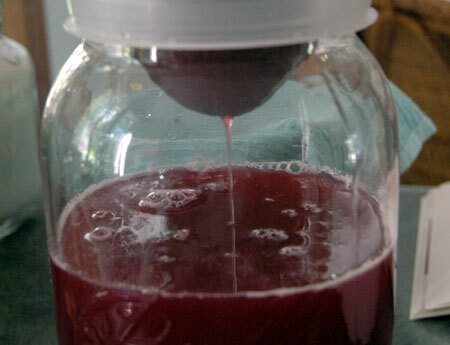 To strain the remaining grape pulp from the culturing vinegar, I poured it off into a large spouted bowl, rinsed out the glass jar to remove any clinging seeds, and strained the vinegar through fine mesh back into the jar. The wire steeping basket from a teapot fit the opening perfectly and removed most of the solids, though a dark cloudy layer started forming at the bottom once the liquid settled, so I may have to add a cheesecloth or flour-sack towel when I filter it a second time into bottles for storage. I’ll give it a little longer to ferment first, although it clearly smells like vinegar already. Such an exciting result, and reassuring to know that if I somehow use up this almost-gallon of vinegar before next fall, I can always make more using the grapes from our canned juice! I never thought of using the spent mash to make red wine vinegar. I wish I would have saved mine this year. I’m anxious to hear how it turns out and will for sure do that next year! Diana, it definitely made vinegar, from the smell… wish I had some pH strips to test the acidity! It also has quite a culture growing on top of it already after straining, much more so than I have ever noticed with making apple scrap vinegar. I don’t think it hurts anything, but could cause issues for usage later on, I guess… but I hate the thought of boiling it and killing all that probiotic action.